Every person writes or tells her ideas and opinions towards something good or something bad. It’s pretty healthy to know other people’s say on the things you do. But being misunderstood is one real pain… a thing that’s too hard to handle most especially if you don’t want a stain to cover up the clean relationship you have with someone. No matter what you do, may it be for them to like you or otherwise, they will always have something to say. For an instance, you say things for good but they never try to think of the benefit they could get from your words. And then you write down your feelings in order to help yourself move on from a certain kind of situation and to ease whatever feeling you’re having towards something or someone. In short, they don’t try to understand what you really mean and what you are already feeling. They immediately do the judging that leads to a whole of misunderstanding. The word itself starts with a negative prefix and actually makes a mess to the entire condition you’re into. 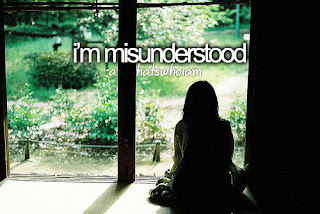 Being misunderstood is never easy. It can be frustrating at times. But sometimes, you never tend to care about what you are feeling because all you wanted is to bring back and save the good bond. On the other side, it also takes a lot of courage and prayers to overcome the struggle of wanting a misunderstanding be fixed. When currently facing a quarrel with someone, you wish you can whisper them to interpret things correctly before they experience such thing and later on realize how definitely hard it is.